A short, obscure trail through an old growth forest at the foot of Mount Shasta. The path encounters numerous areas of black, exposed lava rock, remains of an ancient lava flow. Mount Shasta from a point off of the Black Lava Trail. 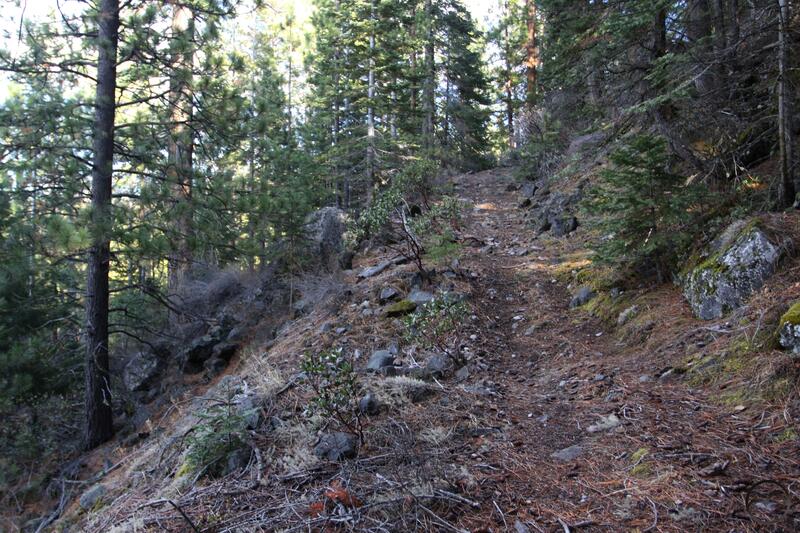 Lying at the border between the Shasta Valley and the great black forests of Mount Shasta, the Black Lava Trail is a relic from an earlier age on Mount Shasta. All but lost and forgotten by most hikers, this obscure path is a testimony to an earlier era of the mountain’s use. Initially a rugged 4×4 road, it fell into the newly created Mount Shasta Wilderness, which was established in 1984. Following the establishment of the wilderness area, vehicular travel was prohibited and the old road was officially designated a trail. Although the route is short, it does penetrate the dark, primeval forests the blanket the northwestern foot of the mountain. After the logging operations of the early 20th century cleared much of the low elevation timber off of Mount Shasta, there were few old growth forests left in the mountain’s lowest elevation. However, the forests on the northwest side, despite their proximity to the lumber mills in Weed, were preserved because the forests had grown out of a harsh, rugged lava flow. The appropriately named Black Lava Trail explores these ancient forests and offers interesting opportunities to examine the remains of the lava flows. It should be noted that this trail is neither long nor difficult. At one time there was a narrow foot path extending beyond the end of the main trail that was once used for training by the Siskiyou County Sheriff Department. All but the first few dozen yards of this route have been obliterated by time and nature. Also, unless hikers are willing to do some bushwhacking, there are no great views of the mountain beyond the trailhead. Still, if one is looking for a lonely stroll through isolated, ancient forest with interesting lava features, it is hard to go wrong with the Black Lava Trail. This is particularly good option in late winter and early spring. The Shasta Valley seen from the trailhead. A brief note on the taxonomy of the trail is worth mentioning. Despite falling within the boundary of the Mount Shasta Wilderness, this route has been placed in the Shasta Valley section. The reasons for this are manifold. First, the trail is dramatically different from every other trail on Mount Shasta. The other 9 trails are all high elevation, offer great views of Mount Shasta and surrounding areas and give hikers a sense of being high in the mountains. The Black Lava Trail is a low elevation trail only a few hundred feet higher than areas traveled by the Yellow Butte and Haystack Trails, highlights of the Shasta Valley area. Moreover, the drive in to the trailhead passes through the high desert environment of the Shasta Valley. This continues all the way to the roads end at the trailhead. 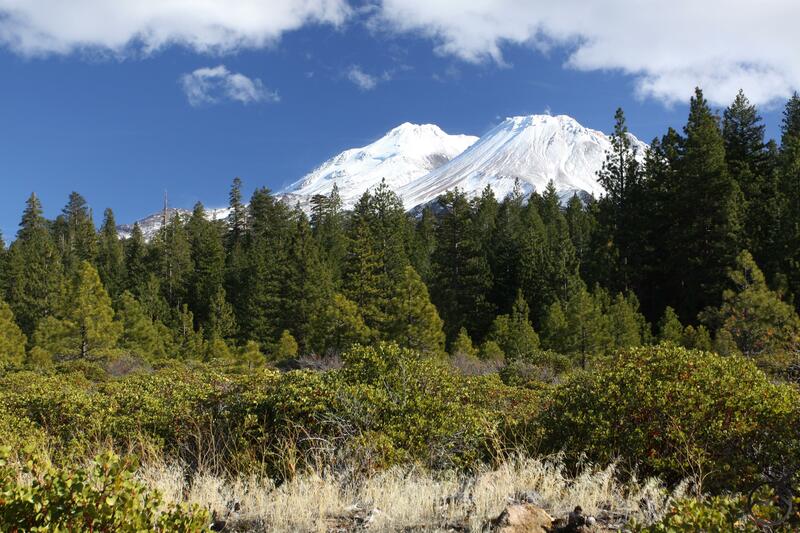 Lastly, when hikers are sifting through the hiking options on Mount Shasta, they are likely to be looking for hiking opportunities more typical of the higher elevation trails that lurk around treeline. 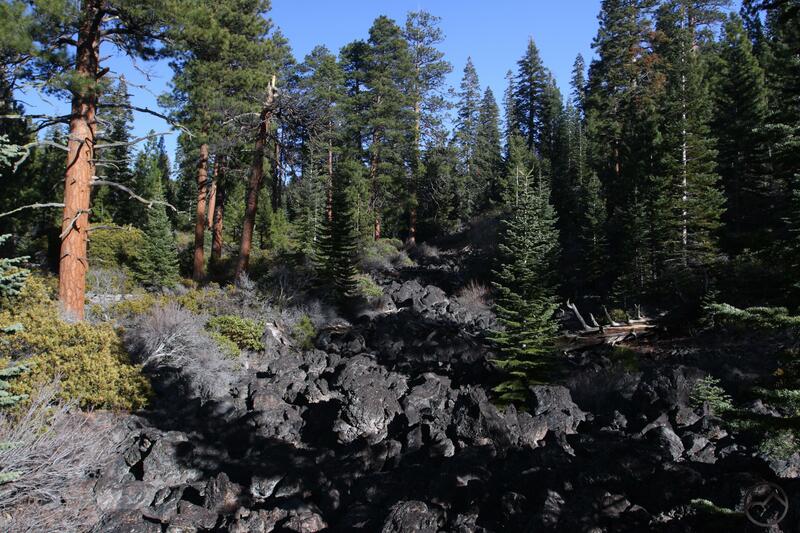 The Black Lava Trail would not be a fitting option for those looking for an alpine experience. 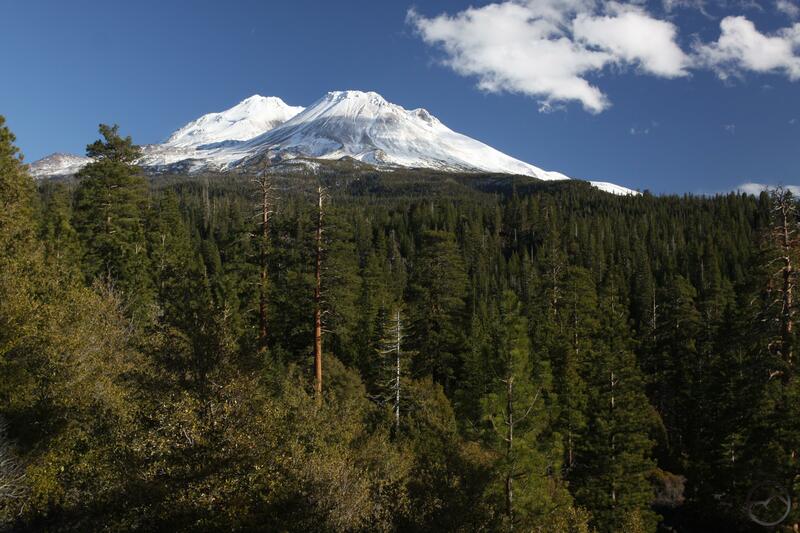 Conversely, hikers looking for good trails to do in the off season, which includes the trails in the Shasta Valley, are more likely to hike the low elevation Black Lava Trail when temperatures are cooler and the higher elevation options are still covered in snow. Taxonomically it is odd not to include the trail with the other Mount Shasta trails. Practically it is a better fit associated with the Shasta Valley trails. The initial climb up the flanks of the lava flow. Even though the Black Lava Trail is all but forsaken, the trailhead is still marked by the usual Forest Service accouterments. 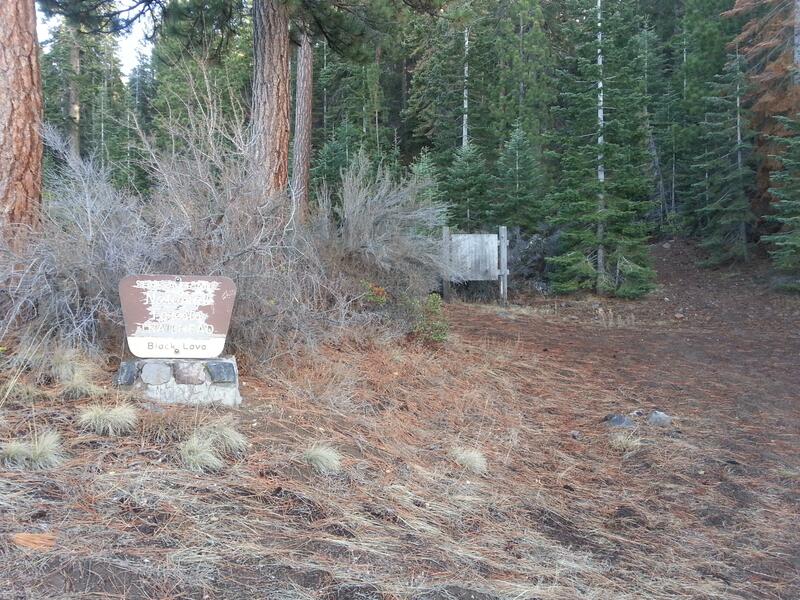 A carved wood sign identifies the trailhead and a large board that was once covered with notes and information on the trail are both present. 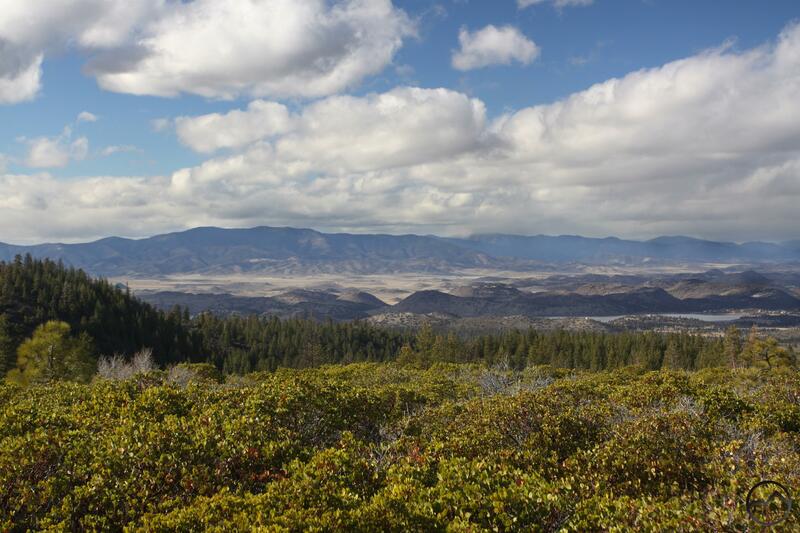 Be sure to walk a few dozen yards back down the road to enjoy great views of the Shasta Valley and Mount Shasta. To begin the trail, hike over the large earthen hump at the end of the south end of the parking area. This mound was built to block motorized vehicles from using the trail. While this may work for jeeps and such, it has not blocked the occasional ATV, the signs of which can be seen at times on the trail. Such use should not deter hikers from using the trail. It is only an indication of how little use the trail actually gets. Beyond the mound, the trail ascends moderately up the flanks of forested lava flow. Black basalt rocks are obvious along the entire length of the climb. After a couple hundred yards of climbing the trail levels off. This marks the unsigned passage into the Mount Shasta Wilderness. From here the trail continues to the southeast. Note the large ponderosa pines and the large basalt boulders. The trail passes occasional, small lava fields. The encroaching forest has not yet managed to take root in these small collections of dark rocks. A fine example of exposed lava near the trail’s end. As the trail proceeds there is a brief, filtered view of Mount Shasta, 10,000 feet overhead. This is the only view of the mountain from the trail. Eventually the trail arrives at a short, steep climb. As the trail climbs it makes a switchback around the low end of a long lava ridge that extends to the south. For those willing to bushwhack, there is an unusual but great view of Mount Shasta from this ridge. To make the short trek, look for an obvious worn spot climbing up the low ridge immediately after the trail has completed the switchback and now parallels the ridge. There is a fairly obvious route through all the brush for about 40 yards or so until the thicket finally encloses the top of the ridge. From there one gets the unique perspective on Mount Shasta. Back on the trail, the path continues little further. The forest opens up and is less dense along this level section. There is a fine collection of gorgeous old growth ponderosas here. The trail proceeds a little further until it comes to a sudden halt where the forest gets thicker. There is a very faint path continuing through the dense growth. A short distance later the trail emerges on the edge of a small sink filled with lava rock. It seems as though the old trail may have continued up the rocky gully on top of which is a fairly extensive treeless section and lots of exposed black lava. If this is not a good option, there is a nice section of the lava flow immediately south of where the trail ends. It is only about a dozen yards or so off the trail. It makes a nice place to stop and enjoy the unusual terrain in the forest. Unless one is willing to endure the bushwhack atop the lava ridge, this marks the end of the journey. Mount Shasta looms above the trailhead. From downtown Weed at the beginning of Highway 97, drive east on Highway 97 for 5.2 miles. Turn right onto Forest Road 42N15. There is no sign identifying the road but there is a stop sign marking the spot. 42N15 is a dirt road that, while good in most places, does require a high clearance vehicle in a couple of places. Proceed down the road for 1.65 miles to the railroad crossing. There are no gates so be sure no train is coming from either direction before crossing. Once across, continue for another 0.1 miles to Forest Road 42N14. Turn right and climb steeply for a short, rough pitch. If one continues 20 yards up 42N15 there is a second opportunity to turn onto 42N14 that is not quite as rough a climb. Once on 42N14, proceed about 0.25 miles to the trails end. The last section of the road is not particularly difficult but it is a bit bumpy. Park in the clearing near the trailhead sign. I just wanted to let you know how much I enjoy your site! I homeschool our 6 year old and your hikes with such wonderful descriptions and information have made for many fun and adventurous nature explorations! You are our resource when looking to explore some new place. Print off the hike info and off we go! So fun to read your descriptions as we pass along things and learn as we go 🙂 Thanks! 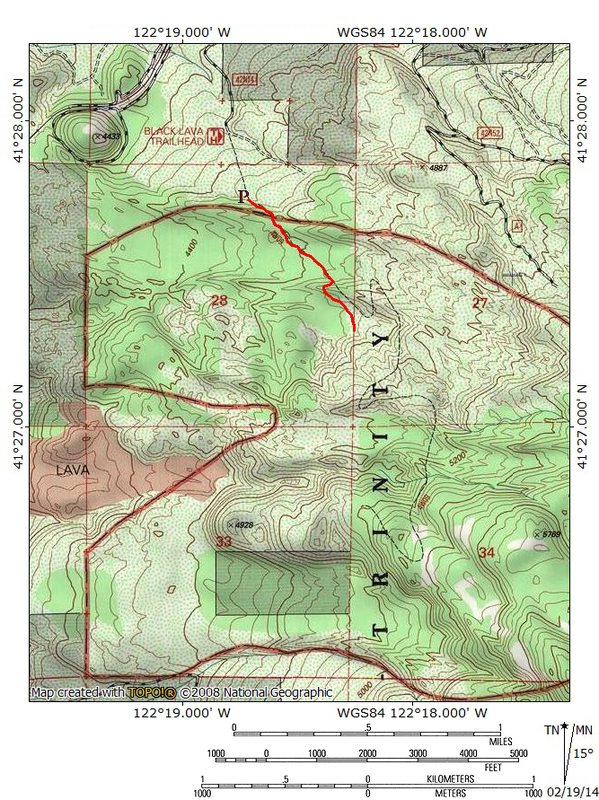 Did a gps survey of that trail a number of years ago, trying to follow the exact trail marked on the USFS map. Came to the conclusion that the marked trail actually never existed, but must have been added to the map by someone in the USFS who maybe planned on actually building the trail at some future point. The old road was very visible, but the rest of the marked trail went thru some pretty impossible terrain, no chance of any trail ever existing there. A group of us spent many hours in that area. It is a very pretty area. Hiked this trail this afternoon, and 42N15 is in bad shape. A high-clearance vehicle is pretty much a necessity, as recent rains have carved out gullies in the road and left large rocks strewn all over the road. The last .25 miles before the trailhead along 42N14 is the worst, as the rains have carried a large amount of loose dirt down to the bottom of the final climb; my AWD Forester couldn’t get enough traction to surmount the last hill, and nearly got stuck trying to back out. I suggest parking shortly after the junction of the two roads and walking the final .25 miles to the trailhead. Other than that, your description is apt – the views of the Shasta Valley are incredible, and the trail itself is very peaceful, secluded, and full of enormous old-growth conifers.